On todays "I Made It Monday" I'm wearing a basic black pencil skirt that I made with a little leopard flare. I love leopard print but in my wardrobe I only have it in shoes, scarves, belts & bags. I love leopard on other people in the form of skirts, dresses and jackets but just don't think it works for me. So I've found a way to add a little more leopard print to my wardrobe. For me this is a happy medium; it's still my basic black staple but it's a bit more fun and interesting with the addition of the leopard print. Maybe this is me taking baby steps towards an actual piece of leopard print clothing! This is an easy technique you can use to add some colour or pattern accents into your wardrobe if you're like me & too chicken conservative not ready to go all in! 1. Take a pencil skirt pattern or existing pencil skirt like I did & trace to get front and back pieces. (Take into consideration the amount of stretch your fabric has). Add allowances for seams, waistband casing and hem. 2. Deciding how wide you want your accent strip to be (e.g. 10cm) deduct 5 cm from each side on both front & back pieces. 3. With right sides together sew the accent strip to front & back pieces. 4. 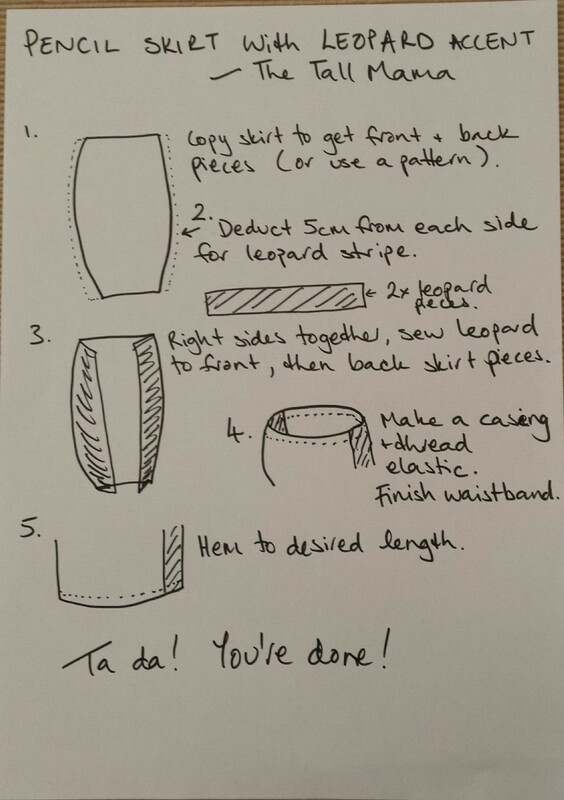 Make a casing for your waistband elastic. Thread elastic & close casing. 5. Hem your skirt to desired length. Ta da! You have a fabulous new skirt! Who loves an action shot! Super cute! And great if a skirt is a bit too tight! It'd be perfect to add some extra fabric and make it fit! Love this idea and adding that little "pop" is unexpected! I love the leopard print! Super chic! You are so clever! I love leopard print! It is such a classic! Terrific job! Bold designs like leopard-print should be used sparingly as accents, as you did on this wonderful skirt. I admire your talent at refashioning. I'm trying to learn how to sew to alter my purchases from thrift-stores which need some help. Thank you! Starting with thrift store purchases is a great idea as it's not a great loss if things go horribly wrong!